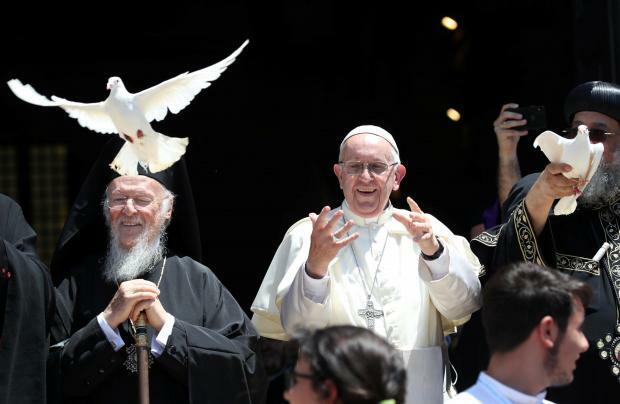 Pope Francis frees a dove during a meeting with Patriarchs of the churches of the Middle East in the St. Nicholas Basilica in Bari. Francis also repeated his view that the "status quo" of the contested city of Jerusalem should be respected, and backed a two-state solution to the Israeli-Palestinian dispute. "Truces maintained by walls and displays of power will not lead to peace, but only the concrete desire to listen and to engage in dialogue will," he said in his second speech of the day, after a private meeting among the religious leaders. "Let there be an end to the few profiting from the sufferings of many. No more occupying territories and thus tearing people apart," he said. Israel says its fence-and-concrete barrier on the West Bank was built as a bulwark against Palestinian attacks while Palestinians say it is a land grab that may deny them a state. Francis said every community in the Middle East should be protected, "not simply the majority". He also condemned religious extremism, saying many conflicts in the region had been stoked by "forms of fundamentalism and fanaticism that, under the guise of religion, have profaned God's name, which is peace, and persecuted age-old neighbours". Francis spoke twice about Jerusalem, the holy city whose status is at the heart of a bitter conflict. Israel says it is the country's united and eternal capital while Palestinians want East Jerusalem as the capital of any future state. The pope said Jerusalem's "status quo" as a city sacred to Jews, Christians and Muslims should be respected. Francis has previously called for all to honour United Nations' resolutions on the city. The Vatican expressed concern last year when Washington announced the move of its embassy to Jerusalem from Tel Aviv. He denounced the "terrible suffering," particularly of children, in Syria, where the seven-year-old war has killed hundreds of thousands of people and uprooted about 11 million others, including 6 million living abroad as refugees. St. Nicholas, who lived about 1,700 years ago in what is today Turkey, is venerated among Orthodox Christians, including those in Russia, which is Syria's ally in the civil war. The Russian Orthodox Church sent its number two to the Bari meeting. Francis condemned the "murderous indifference" and "complicity silence of many" fanning violence, specifically mentioning the arms industry. "You cannot speak of peace while you are secretly racing to stockpile new arms," he said. An exodus of Christians fleeing conflict and hardship, risked "disfiguring the very face of the region," he said, speaking from a podium on the waterfront with about 20 other Christian leaders, most of them from Orthodox Churches. In a gesture to show their equality, he and participants including black-robed Orthodox leaders were driven together in a tourist-style open-top bus from the 12th century Romanesque style Basilica of St. Nicholas to the prayer service on the waterfront facing east.